Is there such a thing as a good and bad game studio? In this episode, I’ve got game bloggers Murf and Doone to discuss our perceptions of game studios, what influences them, and whether the ethical practices of a studio have any relation to the quality of games being produced. Well, that was unexpected. I’ve been involved with the game of LOTRO for about four years now, and have followed it fairly closely for my responsibilities on LOTRO Players for about two of those, but never have I read such an in-depth “first-person” viewpoint of the inner workings of Turbine as what was posted by ex-QA dev Aylwen in the LOTROcommunity forums – not to be confused with the official LOTRO forums – yesterday. Oh, we’ve heard grumblings and whispers and rumors, and we’ve read the glassdoor reviews, but never have we seen so much from the inside of the traditionally tight-lipped company. Aylwen claims to have no beef with his former employer, and seems to wax nostalgic as often as he criticizes. Producer’s note: Since the completion of this show, it has been announced that parent company AOL is closing all Joystiq properties, including Massively. I toyed with the idea of recording a short segment for the beginning of the show explaining these developments, but considering the amount of work involved and short timeframe, I decided to release this episode as-is, from a time before either of us were aware of the closures. 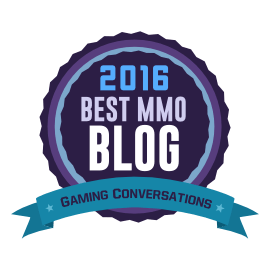 Justin is an amazingly talented writer, and I look forward to reading his musings on gaming and MMO’s for years to come. If not on Massively, then wherever he decides to post them. Best wishes to all at Joystiq. This month, I’ve got Justin Olivetti from Massively and Biobreak. We talk about how Justin moved from a purely amateur blogger to paid gaming journalism, the relationship between blogging and journalism, some of the criticisms to come out of #gamergate, and the inception of the Newbie Blogger Initiative.